My husband and I got married in 2007, which by now is long enough ago that I have to think for a minute before remembering what our anniversary date actually is. I love my husband dearly and feel privileged to get to go through so many stages of life with him! From the very beginning of our relationship, there was a level of comfort, strength, and security that I had never experienced before; and I feel truly lucky to be able to say that all of the foundation of our relationship is just as solid as it has ever been. And as anyone who has been in a long-term relationship knows, there are stages to your relationship. Focuses shift, responsibilities change, and people grow. I love my husband, but our relationship continues to take different shapes depending on which stage of life we happen to be in! I love my husband; but when we were first married, 21 years old, and broke… things were hard. We were both trying to figure out life after college and working multiple jobs. Life was hard, but what was incredible is that our relationship wasn’t hard. There wasn’t a question ever a question of whether or not our marriage was the right decision, and that security in our relationship helped us get to a better place in our lives. I love my husband; but when our first baby wouldn’t stop crying, and he had to work around the clock to make ends meet… things were hard. Motherhood was not what I expected, and I rarely had a break. My husband was working all the time to support us, and he rarely had a break. Both of us were exhausted and burnt out, but still there wasn’t ever a question of whether or not we had made the right decisions. We loved each other, and we loved our new child. Everything else would work out. 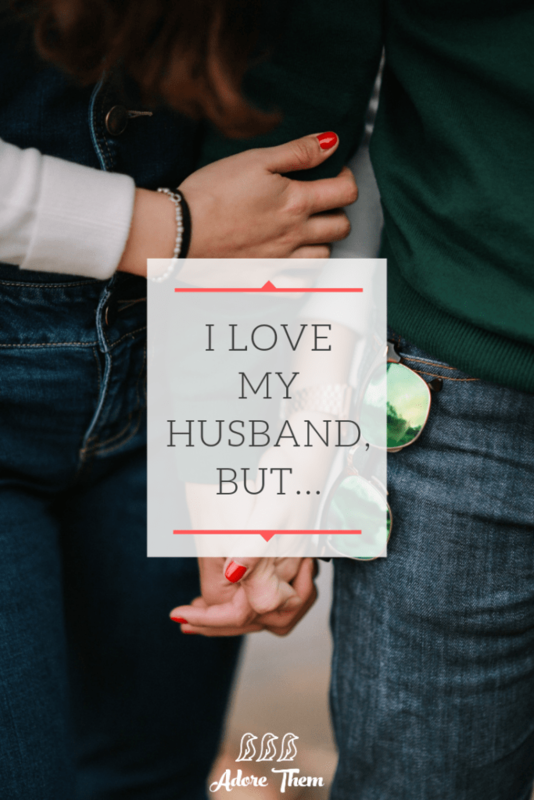 I love my husband; but when we were trying to buy our first house, and I was also giving birth to our second son… things were hard. After my c section, my husband spent much of his time in the hospital on the phone trying to get us our first home. The nurses gave him some questioning looks, but I was on-board! Me and baby were doing just fine, and I knew he was right there for us if we needed him. But life has crazy timing sometimes, and he was doing what he needed to do for our family! The hardest part was when his boss demanded that he come back to work despite me being only a few days post-op and trying to care for a newborn and a toddler… thank goodness for family and friends, and if you have the luxury of paternity leave – be grateful for it!!! I love my husband; but when I was a stay at home mom to two little boys… things were hard. At least by this point in our relationship, life type things were starting to stabilize. I was involved in fulfilling freelance work, we were in a great home for our small family, and finances were improving. But as any stay at home moms knows, there is something so draining about this phase of life! The reality was that the relationship between my husband and I was simply not the priority at that point in time. But what made all of that okay, is that we were both on the same page. We both had (and continue to have) so much trust in our foundation that if the focus needs to be on the kids for a bit, that’s okay! I am grateful and proud of the life that we have built together. We have two incredible kids and a community of support around us that amazes me on a regular basis. My husband continues to advance in his career, and it makes me so happy to see him rewarded and recognized for all he has done to get to this point. We just bought our dream house and are beginning to see the fruits of our labor pay off! So sure… there have been Valentine’s Days without a nice dinner. There have been anniversaries without lavish gifts. There have been birthdays without cake. But that hasn’t made our relationship weaker… I still love my husband. He still loves me. And any time we get the chance, we still LOVE spending time together. At the end of day… I love my husband, and that’s enough.